Welcome to Chocolate Chip Cookie Week, celebrating one of America’s most iconic and widely loved comfort foods. I prefer my chocolate chip cookies crisp throughout, so even just in principle, softening them in milk ruins my favorite textural element of these cookies: the snap-crunch. Beyond that, a properly baked chocolate chip cookie will quickly lose its structural integrity and turn to a crumbly mess after even just a quick dunk. (This is why dipping Oreos in milk is fine by me; they’re harder and more processed and somehow soak up less of the milk than a homemade chocolate chip cookie.) I’m not easily icked out, but floating chunks of milk-logged cookie in my glass are off-putting. 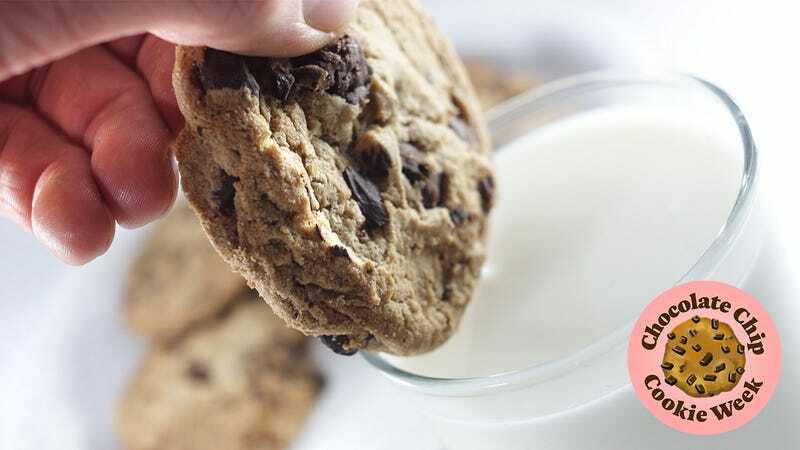 It’s undeniable that chocolate chip cookies and milk are a great combination—alongside each other, not together. Bite of cookie, sip of milk to wash it down. Beautiful. It seems to me that if your cookie is hard enough that it requires dunking in milk to soften it, then it’s not a properly baked cookie to begin with. What am I missing about this supposedly beloved dunking practice? Dunkers, explain yourselves.